So many of my class members don’t realise just how far they have come! 1. You keep moving no matter what – You are no longer phased by not being step-perfect and aren’t worried, embarrassed or stressed about going wrong! You completely get the point of the class which is to keep moving to work every part of the body. 2. You feel like you can put more effort into the routines – This means you are getting fitter. At Dance Fit you can perform the moves at 50%, 100% or anywhere in between. When you feel you are able to push yourself more towards that 100% you know you are improving. 3. It’s starting to feel easier – As your fitness builds you are likely to feel less fatigue during class and less muscle soreness after class. This is because your cardiovascular endurance and your muscle memory start to improve. 4. It’s starting to feel hard again – Don’t panic, you aren’t going backwards! This is actually a good thing! At Dance Fit, new moves and new routines are introduced every month to ensure progress doesn’t stagnate. It’s normal to find the class harder when new exercises are introduced. Remember if the class isn’t challenging you then it’s not changing you! 5. 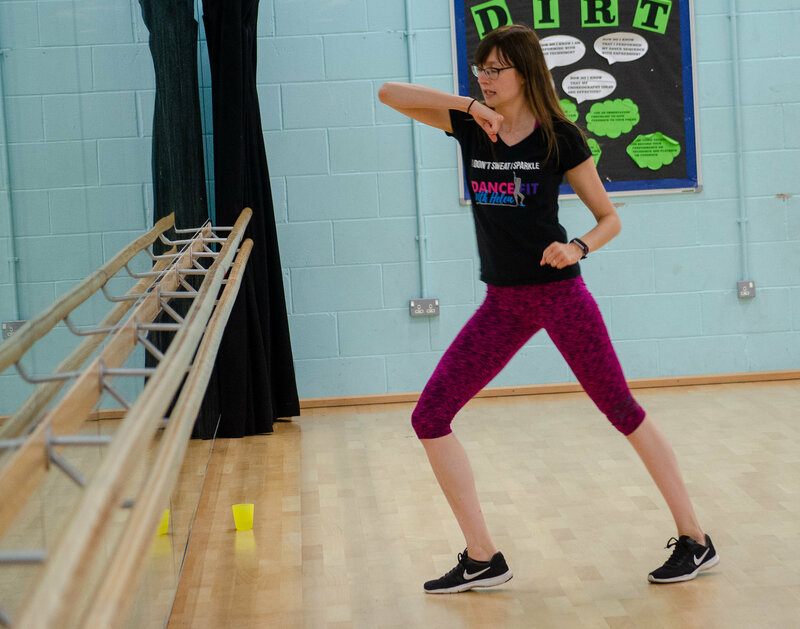 You feel more body confident – Aside from improved fitness, body confidence is probably one of the best benefits of Dance Fit. Many of the routines involve loosening up and getting comfortable with moving. Dance Fit really celebrates your body. Think back, did you feel self-conscious when you first came to class? Were you worried about exercising and moving in front of others? Worried about how you would look? Now think how you feel now. If you’ve shifted your focus from what your body looks like to what it can do, then you’ve taken a big step forwards. 6. You are enjoying yourself – Hurrah! You’ve found a type of exercise you actually like! What does this mean? You are way more likely to stick at it meaning you will be undertaking regular exercise. It also means you’ve relaxed which probably means you’ve busted many of those fitness class myths. People aren’t staring or laughing at you. You can do it despite your age, weight or fitness level. The misconceptions about what exercise classes are like and who they are for create big barriers for people trying to get into exercise. Overcoming these fears is a big deal. 7. Your flexibility and balance has got better – So often overlooked but so important! Good flexibility and balance are skills we take for granted when we are younger but they are so important as we age. It’s use it or lose it. Keep using it and you will benefit from greater mobility and a reduced risk of falls and injuries. Dance Fit routines feature a lot of work that tests these areas and improves them. 8. You remember the moves when your instructor forgets them – You remember the routines better than you think! Dance Fit is a mental workout as well as a physical workout; it’s good for your brain! 9. You’ve got to know other people at class – When you start to get to know your other class mates you know you’ve become a class regular. With exercise consistency is key so well done to you for turning up week in and week out. Dance and dance based fitness classes are great for socialising and as soon as you start to see going to class as an opportunity for socialising, you have yourself another source of motivation to go! 10. You can do things you couldn’t do before – “I can’t jump!” I remember one lady telling me when she first started coming to class. I’m proud to say that now she can! Dance Fit combines traditional exercise moves with dance moves. It really is a full body workout and new moves are introduced every month. When you master a move you have always struggled with that’s when you know you’re doing well! ← 16/11/2018 The Fitmas Wish List!